Although you will often see twenty-first century skills and digital literacy referred to as one and the same thing in much of the literature, there is a considerable difference between the two. Many of the skills often described as 21st century skills do indeed have both analogue and digital applications, but developing 21st century skills alone does not make someone ‘digitally literate’. Thus, 21st century skills can be developed and integrated into digital literacy-based activities, but the two are not synonymous with each other, exactly. In this article, then, we take a look at how 21st century skills can be incorporated into technology-mediated activities and classes. Before you read this article, please ensure you have read the Digital Literacies Primer for a basic introduction to digital literacy. 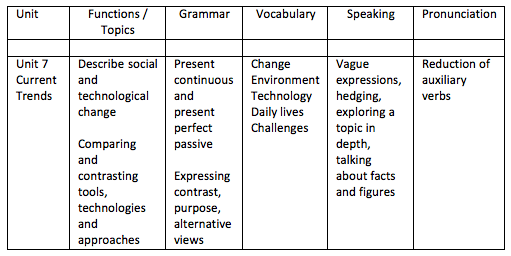 We’ve found this kind of grid to be very useful – it allows a teacher to plan strategic, principled use of technology, whilst ensuring that the literacies and skills developed fit well with the theme of the learning materials, and allow learners to appreciate the link between seemingly disparate elements of the activity or lesson. Let’s turn now to consider how 21st century skills slot in to the concept of digital literacy, and look at examples of how they might be incorporated into some typical activities. Many digital literacies equate to the areas of critical thinking and problem solving: information literacy involves learners considering sources of information in terms of their veracity, appropriateness and usefulness, gaming literacy invites learners to think about situations and dilemmas (from different points of view, from logistical to moral) and to solve problems before being able to move forward in gameplay, and code literacy teaches both logic and troubleshooting skills as learners acquire the skills they need to make technology work for them, in a constructive and creative manner. Typical activities: ‘modern traditional’ activities such as web treasure hunts and webquests (http://www.teachingenglish.org.uk/article/webquests) are particularly suited here, as are online games and apps which involve problem solving or scenario-based decision making, printed or e-readers and mazes in the format of ‘choose your own adventure’ readers (e.g. http://www.richmondelt.com/international/series/details?id=43). Literacies which fit into the ‘focus on connections’ area are particularly relevant here: personal literacy might incorporate ways of communicating with the outside world and of expressing oneself, whilst participatory literacy suggests working as part of a group or collaborating on distance produced content, taking part in discussions and group work, working towards a common goal. Typical activities: keeping a blog (https://edublogs.org/), distance projects and collaborative content creation (http://www.britishcouncil.org/etwinning), email or online chat-mediated penpal exchanges (http://www.mylanguageexchange.com/penpals.asp), live chats between geographically-separated groups, Skype chat, etc. Here we might look at literacies such as multimedia literacy, with its concentration on multimodal content creation, or remix, where proponents not only combine and manipulate media, but subvert it at the same time. Typical activities: activities which involve audio (e.g. https://audioboom.com/) and video creation or editing (https://present.me/content/), poster design (https://www.canva.com/create/posters/), collaborative or individual story-writing (https://www.google.co.uk/docs/about/), image collections (https://www.flickr.com/) or video libraries (https://www.youtube.com/?gl=GB) also fit nicely into this category. Digital literacies which might fold into the 21st century skill of citizenship include remix as a way of expressing values, political opinions or points of view, (inter)cultural literacy with its emphasis on the meeting of minds, countries, opinions and cultures, and participatory literacy, with a focus on working together and taking part in action or activism. It should be noted, however, that this is an area which will require a good deal of care and local knowledge if it is to be implemented safely and productively. Typical activities: activities which involve research and evaluation of opinions, exploring critical issues (http://gisig.iatefl.org/elesson-inspirations) – both global and local, intercultural projects and exchanges and anything that encourages learners to examine their place on the planet, and some of the issues that affect that place. This might include personal, participatory and network literacies from the ‘focus on connections’ area, and might even extend to literacies in the ‘focus on information’ area, with activities aimed at researching and extending knowledge and learning. Typical activities: activities involving personal development might concentrate on blogging (see above) or other types or reflective activity, as well as opportunities for personal and professional development through the reading of blogs, journals and other online sources of learning, and even study opportunities in the form of MOOCs (https://www.futurelearn.com/courses/explore-english-language-culture) or similar. Student leadership might be encouraged through the use of discussion fora or other collaborative areas where roles are fluid and constantly changing (http://wenger-trayner.com/introduction-to-communities-of-practice/). As we can see, it is possible to incorporate a focus on both digital literacy and 21st century skills into a language class, whilst still ensuring that a language focus is not lost, and due attention is paid to covering curriculum and key content where this is considered desirable. A complex combination such as this needs variety (to ensure learners are using a wide range of tools and approaches throughout a course), but – most importantly – the mix needs to be regular and principled, and overtly described to learners, to point out exactly what they are doing, and why. Regular incorporation of this mix may go some way to ensuring your learners acquire an integrated level of proficiency with technology, digital literacy and 21st century skills, which should be of benefit both in further study, and in professional contexts. Find out more about digital literacies in our teacher development module Engaging with learning technologies – digital literacies.